Great house and location. We loved this house. It was perfect for our family of 10. Everyone had their own space. We loved all of the balconies to enjoy the view. Would definitely rent again! A true home away from home!! So comfortable. Everything you need and more. This wonderful home is a cut above the rest. The pictures do not do justice to the artfully decorated abode. Excellent! Me and my family loved everything about our stay and For sure will be back! It was nice and quiet and very clean! Wonderful family vacation spot. My family enjoyed several days in port Aransas staying at "Hula Girl House". The owner met us with great information and the accommodations were spacious and updated. We easily enjoyed the kitchen and bedrooms and family room. It was a pleasure and we have recommended it to other family members already. House was great! Had all the necessities we needed for a 3 day week-end! House had everything. It was very comfortable for 3 families with 2 toddlers and a baby. I love that it had 3 bedrooms with big beds. The bunk room was great for the toddlers. The parking under the house was great. We will definitely rent the Hula Girl again. Very Comfortable! We loved the condo. It is in a good location, close enough to walk to the beach. The condo was decorated nicely and very clean. All was provided and the office personnel were friendly. The only thing that needs to get corrected is the ceiling fan in the 2nd bedroom, it was not working. Other than that, everything was great and I will definitely return for another stay. Couldnt be more satisfied with our stay. This will be where we stay from now on, period. No more looking for houses and wondering what its going to be like when we get there. Everything about this place is exceptional, you wont be disappointed. Great home for groups. Great house with convenient location. 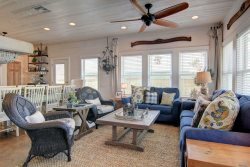 Home has activities for kids (shuffleboard & Foosball) as well as large TV and integrated sound system throughout the house for adults. Great porch with nice breeze. One concern we had was if there would be mosquitoes bc of the pond but we didnt see a single one. House is very convenient to town. My one piece of advice for potential guests is to rent a golf cart ahead of time. Beach isnt within walking distance if you have little kids. Aside from that we had a great time and will be back again soon. Perfect! We stayed for four nights and couldnt have asked for better accommodations. We look forward to going again next year and hopefully for a longer period of time. Beautiful! Port Aransas was nice, lots of places to eat. The house was incredible! I would totally recommend! Check in and out was easy. Beautiful House! Highly recommend staying here! This house was magazine appropriate!!! It was a beautiful place. The kitchen was very spacious. The living area was large and the ping pong table was a hit with the kids and the adults. The bedrooms were a little small having no closets, but manageable. We thoroughly enjoyed our stay. Beautifully Decorated, clean home! Likely to rent it again. Highly recommend staying here! This house feels clean and brand new. Decorating was gorgeous, kitchen well equipped. With 5 teenagers with us, the downstairs bedrooms and kitchenette were perfect for late night board games and midnight munching. Only thing missing was a microwave in the downstairs kitchenette. The inside stairs to the main floor are quite steep, but manageable. Main living and kitchen are spacious and open - great for large or multi families! Thank you, Dale & Mary! Beautifully appointed home backing to sand dune. We stayed for 4 nights over Spring Break. The house was as darling in person as it was online. Nice location on Port A away from Spring Break crowds. Plenty of room for large families. Back porch has a wonderful breeze and You can hear the ocean. Only thing to note with young kids is that one of the top bunks did not have a rail of any kind. But there were plenty of other sleeping options. We would go back! Lovely home that is large enough for a big family/multiple families. This is a unique layout as it is a combination of an old, small cottage with a newer addition. There are 3 living spaces, 3 bathrooms and 3 bedrooms with a small area with a trundle bed. Two kitchen areas. The older unit kitchen and bathroom are old...but still in nice shape. Our family of 7 had plenty of room and enjoyed the house for a 3 night stay. Walkable to the beach...about 10-15 minutes. Highly recommend! This home is beautiful and was perfect for our weekend stay during my brothers big 40 celebration! Close access to the beach, town, restaurants and fun!! Home was set up Perfect. We had 6 adults in our group and this house had everything we needed. Got to meet Dale (Marys husband) during check-in and our check out was a BREEZE!! Mary and Dale were an absolute Delight to deal with. We will be coming back to this home again!! It was a great house to take your family, The open kitchen into the living room was the highlight for the family to be together. Our 6 adults and 4 kids were very comfortable in the house. The house was very clean and well kept. There were ample dishes, silverware and pots. The only challenge that we had was there was no bath tub so the infants had to get their baths in the sink. We would definitely return. Beautiful house! This rental was perfect. Very spacious and has everything you could possibly need. Only a couple of blocks away from Island Surf cart rentals, shops and food. The house was for the volunteers of the Annual Casting for a Cause charity fishing tournament and the owners were amazing enough to donate a golf cart for the event!! Thank you for your kindness and well see you next year!!! I walked in to an exceptionally clean VRBO. It was exactly as the pictures looked. Management was prompt and met us with keys in hand. She have us an overview of the area and the property. There was also a book in the unit that had recommemdations for the local area. As for the unit itself, the kitchen, living area and master bedroom are all on the 1st floor. How great it was that my mother, who doesnt do stairs very well could be apart of all of our activities. The three rooms upstairs were exceptional as well. All had new flat screens and cable. The double bunk bed, futon room was awesome! It had a DVD player and lots of Disney DVDs ready to go for anyone wishing that. Each bunkbed has its own light and plug on the wall. Nice touch for our teenagers. The outside patio is fenced. There is a walkway to a pool. However, and I have to say the only downside, is the path ends and you have to walk on rocks for three whole steps to get to the pool. The next time I used shoes....seriously, absolutely no big deal. All in all, if you want close access to the beach and all Port A activities, this unit is very nice. What you lack in the beach view the unit makes up for in cleanliness and creature comforts-oh almost forgot-strong wifi in the unit. Cheers!! Great house! Great location! Well furnished with everything that you need. We loved the breezeway for sitting outside in the early evenings. My family will be back! It was just as the website had indicated: a very homely, pleasant, enjoyable, practical, complete, clean, adventurous, artistic, surprising, charming and flexible home. We enjoyed all its amenities and we loved the multiple seating arrangements at two levels on all sides. We will be back. And congratulations to you and your husband for your 24th Anniversary on the same day that we had our 50th Anniversary! Just got back from a weekend trip to Port Aransas where we stayed in this home. I give it 5 stars! First of all, reservations and check in were a breeze! We didnt have to spend extra time finding a rental office to sign paperwork and pick up keys. Everything was ready to go and they met us at the house to check us in. Thats VIP service for sure!